I've never known of anyone who talks of childhood experiences in a way that is remotely comparable to Kuya John's: complete with the minutest of details, lavished with tongue-in-cheek humor, and, more often than not, a load of morals. While eating clams, he told me he doesn't eat the unopened ones because it's like barging in on their privacy. It was a light-bulb moment, for then I knew that the creatures of the sea we normally cook with stew have notions of public-private life dichotomy. He cooks really well, speaks at least three local languages like a native, and writes like a Palanca laureate. My brother Ralph wrote secret details about him--and I agree with the fifth one. 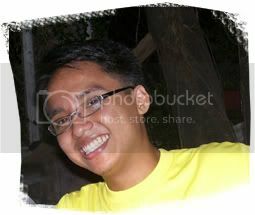 I thank the Lord for the privilege of knowing Kuya John. Twenty-two years old? Now that's old. hi lance! hehe! thanks for the birthday greeting! and for this blog entry! for u to write about me makes me feel like i won american idol!